Triple Play, Triple Play, Triple Play – those words are a buzz now in all technology related trade shows, blogs and etcetera. Everyone in starting from smallest ISP’s and ending with big Telcos are researching the hot Fiber to The Home term, in means of delivering all 3 services – TV + Internet + Voice to the customers premises. It may be a daunting task, if you have nothing but a white sheet of paper and pencil in hand, but a as a result you must come up with a budget and technology that ensures this. Here we want to spark your imagination and give you a knowledge, how to set up the CATV services for FTTH/FTTB and in relation with GEPON networks. Let’s start with a most easy concept. What if you need just TV and nothing else? What if you decide to use 2 fibers to each customer? What if fiber just goes to the multidwelling unit and there is no wish to install the last mile till each customer. You guess right, there is a technology what allows you send CATV only over fiber. 2) CATV transmitter – it’s AN-CATV-TX1550 model, but in may be other wavelenght as well. It’s a device what will converter analogue feed to optical signal and..
3) AN-EDFA-1550 – Erbium Dopped Fiber Amplifier, which actually amplifies the signal and ensures that receiver modules will get it at distances 10 or 20 km. 4) Fiber distribution network, what consists of 1:N fiber splitters, and here it’s convienent to use FTTH optimized splitter box. 5) Receiver, at user side. And you have FTTH network for CATV. Here now you can use or separate media converter, which works for example on 1310 nm (as you sent CATV over 1550 nm). Remember then, you need 2 fibers, in case of such a scheme with Ethernet converter. I NEED TRIPLE PLAY, all 3 services over the fiber. How about this scheme below? Now, that’s totally finished triple play network based on GEPON and works on 1 fiber. What’s the building elements of such network? 5) AN-OLT-CC85000, which is connected to EDFA – and that’s important to mention – each PON uplink will utilize in this case separate port at EDFA, in other way you will not be able to ensure correct transmission levels at ONU side for CATV and PON signal. Note, that in this case CATV transmitter must work on 1550 NM, since the GEPON as you know, works only on 1490/1310. All over 1 fiber. 6) An ONU, with a integrated CATV receiver module what works on 1550 nm. Here also are integrated IAD for 2 Voice FXS port for phone connection, and 4 ports to connect the PC’s or NAT routers, or whatever is needed. 7) In case you wonder now, how to get E1 G.703 port at ONU to connect the PRI PABX, then you should read this article. And now a very specific solution. – I am now the ISP only, I have Internet services only, maybe some voice, but I plan offer TV services later, so, how to do? – Not all my customers are asking for CATV – i do not want to pay for ONU with this port. But maybe later they ask. The trick here is that you can add it later – and when you need! Yes, when customer asks to connect the service, and he need Internet and/or Voice only, you are just going and installing to them IP + Voice ONU or just IP ONU. Now, in case he comes and say, give me TV now, you just come, cut the fiber BEFORE the onu and put in chain the AN-CATV-R-WD. The AN-CATV-R-WD will extract the TV signal sent over the 1550 nm, and passes transparently the rest of GEPONB signal to ONU. It does not effecs perfomance, and it’s very easy to to deploy. 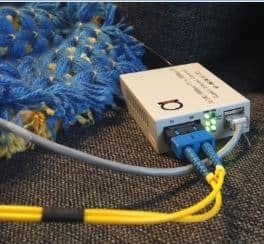 FTTH PON optimized BOX + Splitter set – All in One!